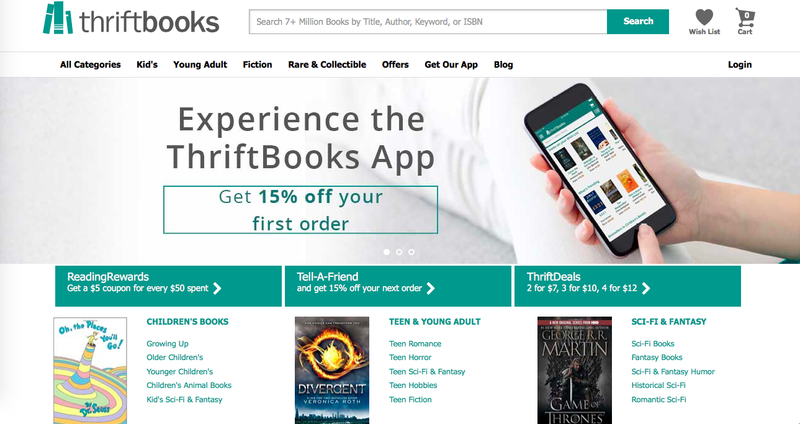 What exactly is Thrift Books? 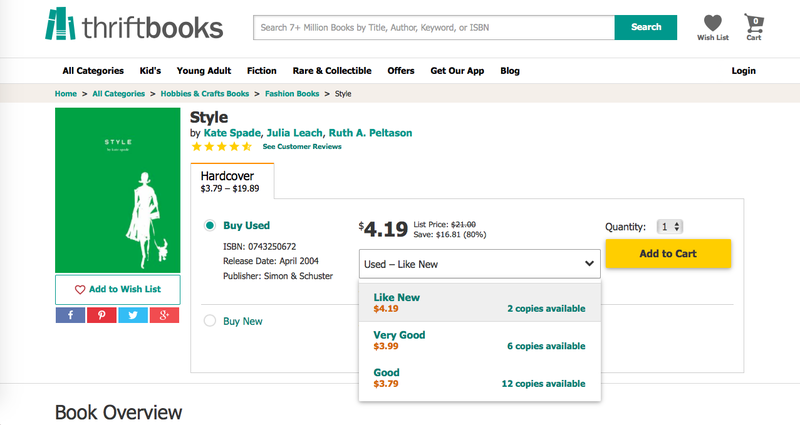 As the name suggests, it offers the cheapest deals for second hand books. While I can always go to local shops such as Book Sale or Book for Less, Thrift Books had me over the widest selections. Almost all titles I have in mind have second hand copies. The site is based in USA and offers worldwide shipping. You can find details of their shipping costs here. Each book shipped to countries outside USA and Canada costs $ 4.99 for standard shipping and $ 9.99 for expedite. It might appear expensive especially when purchasing a number of books. 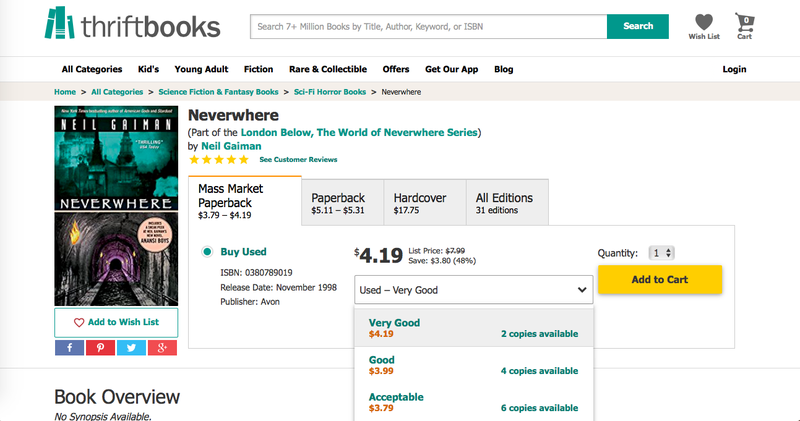 In some cases, I found shipping costs exceeding the actual price of the book. Sounds quite unreasonable but paying $ 4.99 for direct shipping to the Philippines, is way better than hiring a cargo forwarder like Johnny Air or Shipping Cart. When I first tried Thrift Books, shipping costs were dependent on the number of suppliers that sourced the book. I acquired 4 books that fortunately originated from one supplier. Hence, shipping costs were consolidated. On my second attempt, the two books I acquired came from two different suppliers. In effect, more expensive. This was the system I encountered two years ago. Currently, it was modified to 1 book = 1 shipping fee. On my second purchase, the books didn't arrive at all. I requested for replacement and given the previous experience, I devoted a three-month extension. The books arrived after a month. My only consolation, the second hand copies were still in good condition. Everything is almost perfect with Thrift Books. All the hard to find and expensive coffee table books in my list are available. I'm tempted to purchase everything given the good quality of their second hand books. I'm taken aback with the fear that the books might again, not arrive at all. Waiting for three months is fine, as long as everything will arrive. Unfortunately, that assurance will never happen. (life's painful reality hahahaha) A friend had the same experience of not receiving her orders. She opted for refund which was in return, immediately processed. Save for the classic question, will I recommend Thrift Books? Before I forgot, Thrift Books uses the services of the post office for standard shipping. Hence, expect the usual white notification card that requires you to personally claim at the local Post Office. I'm not sure with the case of expedite shipping. I never tried because as mentioned, too expensive. If you have relatives based in USA or Canada, I suggest having it delivered to their addresses. It's faster and safer I guess. Hiring a cargo forwarder is a good idea, but not in terms of costs. Books are heavy and bulky so you might end up spending at a price of a brand new copy. My orders were expected to arrive around February 22, 2018. Unfortunately, nothing arrived on that day. I gave an allowance of one week before making a follow up email. On March 1, I sent a follow up email. I received reply from Thrift Books that a replacement order has been sent. The order was tagged under expedite processing. I was told to expect the package around March 12, 2018. Nothing arrived so I made another email last March 20, 2018. I requested for refund and right away, my payment was refunded. I may not have received my orders but Thrift Books' fast response and processing exceeded my expectations. Despite the failed purchase, I respect Thrift Books customer centred management system. I hope your recent order arrives soon Diane. I will try this company, though I have a huge backlog of books waiting for me to read. Hi, may I ask if the books are all shipped together? When they arrive at the post office, do you only get one notification card for the entire order? Hi! This order did not emerge successful. I opted for refund. I tried Thrift Books again and yes, the books were all shipped together. However, I think the main reason why they were shipped together is because I managed to score books from the same supplier. There's a possibility that your books might not be shipped together, as it came from different suppliers. When they refund an order that never arrived, do they refund the shipping fee as well? Hi! I was thinking of getting books from them for my small business, it's a good thing I came across your blog! :( they have really good deals and a nice business proposal for bulk books. It's too bad they are not reliable with delivery. Is this maybe because we're from Manila?